Built-in luminous frame finder with automatic reflected format framing for 35, 50, 90, and 135 mm focus. Selective exposure measurement can be used also with the 28 mm lens, but in this case a separate finder has to be attached to the camera. The follow-pointer exposure meter is coupled to film speed, shutter speed and stop. Current source: Mallory PX 625 button cell with white colour ring. Exposure meter range: 21 steps from '/,000 to 30 sec. Film speed setting adjustable from 6 to 3200 ASA. 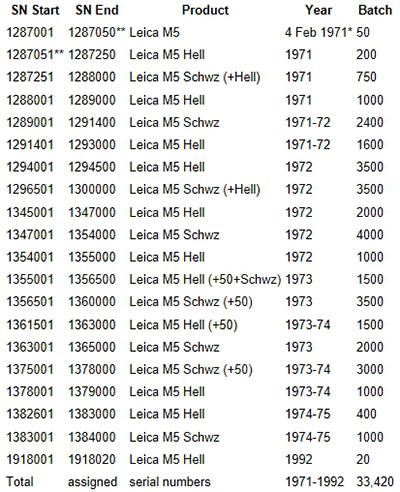 Shutter speed settings from Yz to '/,000 sec. are visible in the view-finder. Automatic flash synchronization for flashbulbs up to '/500 sec.. and electronic flash to '/50 sec. Separate standard flash sockets for flashbulbs and electronic flash. Additional centre contact in accessory shoe for attachable electronic flash unit or flash cube adapter automatically X-synchronized with the shutter. Self-timer giving choice of 5 and 10 seconds delay. Toggle rapid wind lever with safety lock for shutter wind and film transport. Removable rapid loading spool for all standard commercial miniature films, cut and uncut. Film rewind crank in base of camera body. Exposure counter with automatic return to zero on opening camera back. On back of camera: film type reminder disc and calculator for long time exposures. Exposure measurement with preselection of either stop or shutter speed. 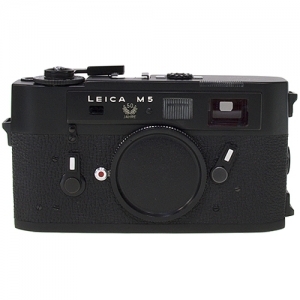 Lenses of other Leica M models can also be used on the M 5, with certain limitations relating especially to the 21 and 28 mm wide angle lenses. 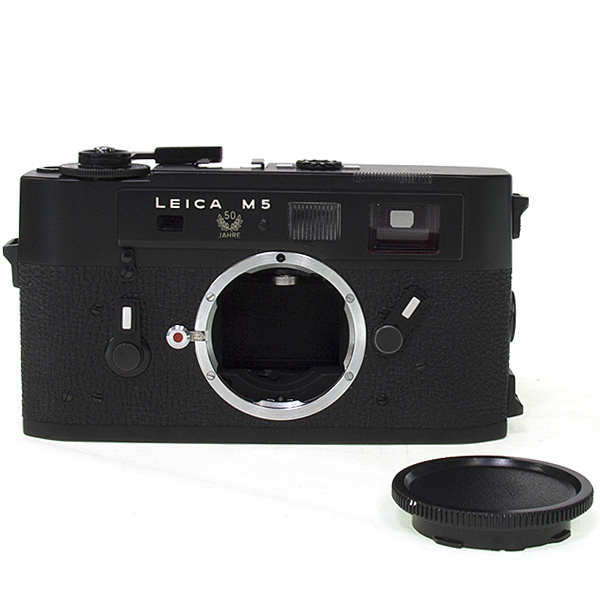 See "M5 Lens & Visoflex Compatibility" below.